The Union Ministry of Civil Aviation along with the Airport Authority of India (AAI) has launched a mobile app named ‘GAS 2019’. The 'Gas 2019' Mobile App will enable users to interact with the co-delegates and speakers besides providing a platform for networking through personal and group chats. 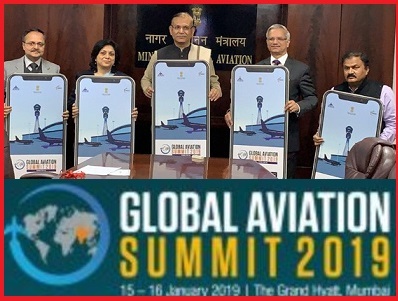 This was launched ahead of the Global Aviation Summit to be held in Mumbai on January 2019. The Global Aviation Summit is scheduled to take place on 15th January 2019 to 16th January 2019 at Mumbai. The Global Aviation Summit is a 2-day summit that will be hosted by the Ministry of Civil Aviation, Airport Authority of India (AAI) and Federation of Indian Chambers of Commerce & Industry (FICCI). The Global Aviation Summit main objective is to provide a platform to the aviation fraternity to discuss the challenges facing the sector in the newly developing growth spots and understand how technology-driven innovations will change air travel in the future. The Global Aviation Summit also aims to be the most comprehensive platform for civil aviation, witnessing a vivid representation from the global aviation ecosystem entailing global leaders from airlines, manufacturers, investors, vendors, cargo, space industry, banking institutions, skill development agencies and states & UTs of India.